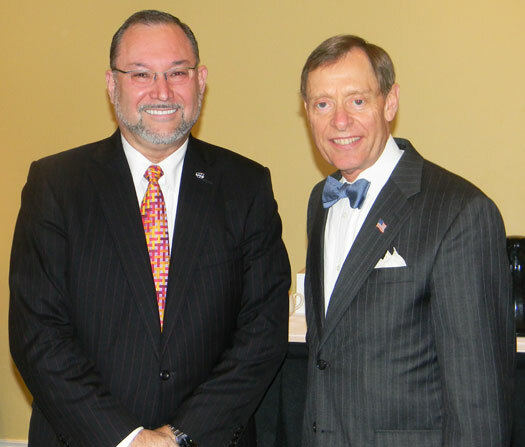 BCBSNE president and CEO Steven S. Martin and President Jerry Farley. That Steve Martin is in the process of ground-breaking work as president and CEO of Blue Cross Blue Shield of Nebraska shouldn’t come as much of a surprise. This is, after all, a man who worked toward a nursing degree at a time — the 1970s — when the field consisted almost entirely of women. He’s comfortable chartering unfamiliar territory. Martin, the guest speaker at Thursday’s Wake Up with Washburn breakfast lecture series, put his degree, a bachelor of science in nursing, to use immediately after college, climbing the ranks in the health care industry. Martin had the foresight to found Prime Therapeutics, a “comprehensive pharmacy benefits solutions company owned by eight independent Blue Cross Blue Shield plans that integrate pharmacy claim processing, drug manufacturer contracting, drug utilization analysis, clinical programs and consulting services into Blue Cross Blue Shield plans and other regionally oriented health plans, HMOs, and specialty pharmacy benefit organizations,” according to Blue Cross Blue Shield of Nebraska’s website. Prime Therapeutics is the largest privately owned pharmacy benefit management administrator in the country. As the CEO of BCBSNE, Martin is one of the leaders of a company studying and preparing innovative models during a time of health care reform. 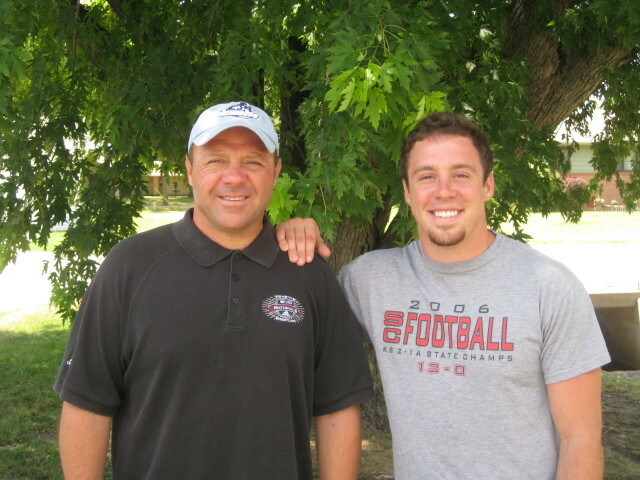 You can read more about Martin’s visit on the Alumni Association’s website. Barbara Mellen and I in 1999, back when I had hair, at The Review office. I was going to preview the August magazine in this blog, but that can wait. I thought it’d be a little more interesting to take a stroll down memory lane today. 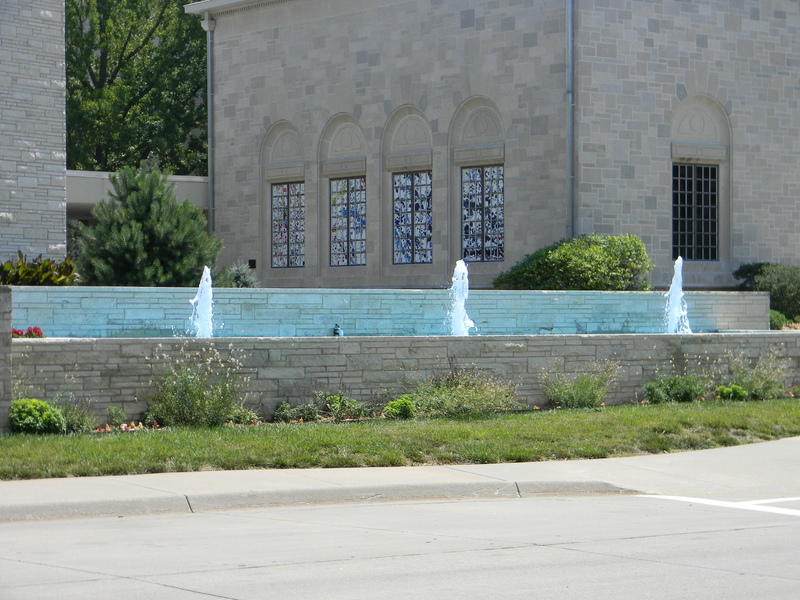 A little after lunch I walked across Jewell planning to take a few photos of the fountains. I figured a caption like “Tempted to dive in on a smoldering day like this” might draw a few laughs. A weak attempt at humor, at best. After snapping a few shots, I walked to the Memorial Union to grab a drink and buy one of our slick new sesquicentennial baseball hats. Armed with a 25-percent-off coupon as a member of the Alumni Association, the hat came at a good price ($17). Washburn’s baseball sesquicentennial hat, a great-looking cap. As I left the book store, several memories came rushing back. First, the year I spent working as editor-in-chief of The Review. To this day, it is one of the best experiences I’ve had. 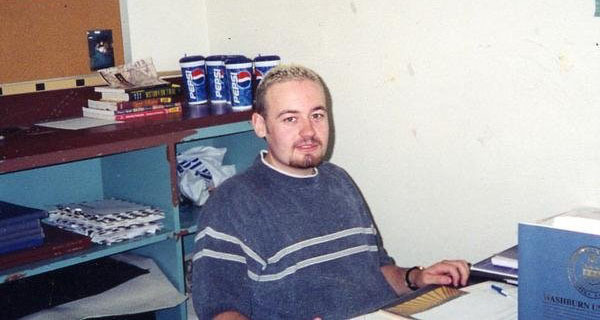 I remembered living on a steady diet of 32-ounce cherry Dr. Peppers and turkey sandwiches while hammering away on stories and laying out pages in PageMaker (how much does that date me?). I’m still in touch with many of the folks I worked with at The Review. 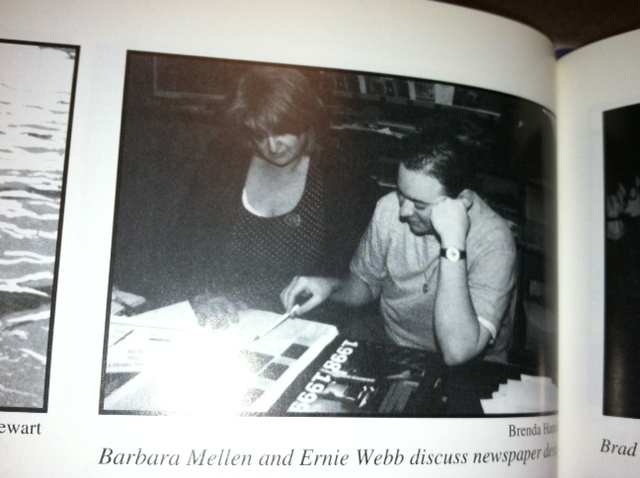 Barbara Mellen, my managing editor that year (1998-99) and I exchanged posts on Facebook (thank goodness for Facebook!) just the other day, for example. I also remembered what the lowest level of the Union looked like in those days. It was a large cafeteria with a small kitchen, handful of video games (pretty sure I spent a good chunk of my Review wages on those games) and a stage for local bands and other events. The newsroom was old-school, to say the least, complete with a dark room and a couch Chris Waterman convinced his dad to let us use. It also served as a bed on numerous occasions. As I walked through the lower level, another memory raced through my brain. That of music videos, vending machines, an arcade and elevators. In fact, that’s my first memory of Washburn. Many folks are surprised to learn that I actually grew up in Missouri. We didn’t move to Kansas until I was an eighth-grader. By that point, however, I knew of Washburn. My parents were in the crafts business (my father still is), and one of the stops on our arts and crafts tour every year was Go Fourth right here on campus. Born on July 3, I spent a handful of birthdays in Topeka, including hours at the Memorial Union playing “Goonies” and “R.B.I. Baseball” in the arcade and watching music videos on MTV. In the evenings, we’d hang out with the Scardina family at West Ridge Mall, which had just opened. Other fond memories of Go Fourth weekend included fireworks, listening to the 1994 World Cup at our booth on the east side of campus, riding the elevator dozens of times for no apparent reason and watching Wimbledon in the commons at the Union. I miss those days sometimes, especially the “Goonies” machine. I really wasn’t kidding … I’d love to dive in there today. Welcome to the Bod Blog! Allow myself to introduce … myself. Always good to reference Austin Powers in a blog. 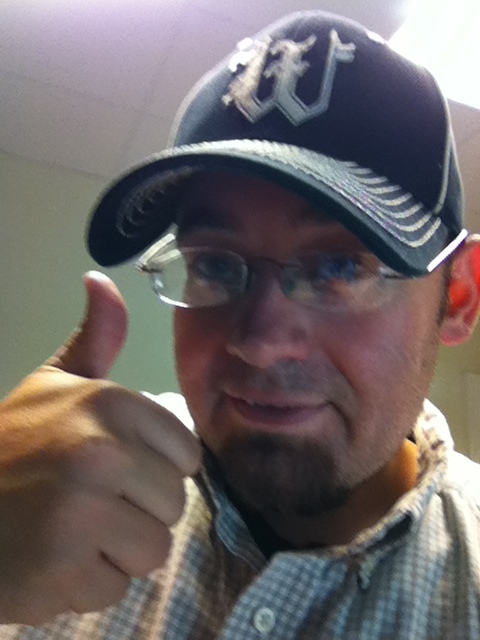 I’m Ernie W. Webb III, the media relations specialist for the Washburn Alumni Association. When I started working at Washburn in April 2011, two of my goals were to revamp our website and begin writing a blog. Thanks to our campus website overhaul, I’m able to do both for our alumni and friends. Please take a few minutes to look over our new website. The project is about a year in the making and is a significant upgrade over our previous home on the Internet. We hope you find it more user-friendly. Also, please check it out on your mobile device. In working with BarkleyREI to redesign the website, we’ve utilized responsive design. Responsive design is ground-breaking. It will reshape the website and produces an attractive, user-friendly experience on mobile devices. As for this blog … please come back often. I’ll be updating it with notes, photos and other items from Alumni Association events and activities.